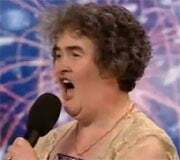 Susan Boyle may not have won the top spot in "Britain's Got Talent," but the big-voiced Brit has just achieved a far more impressive feat: Her video has taken the title of most watched clip on YouTube in 2009. YouTube released a list of its most popular videos of the year on Wednesday, taking into account aggregated views from all over the globe. And while Boyle's inaugural television appearance was the most harmonious of the bunch, the other hot commodities were no less theatrical. Here's the full list of YouTube's most watched videos of 2009. With more than 27 million views under its belt, this creative commercial for Evian water certainly grabbed the world's attention. No word yet how many diaper changes were involved. Surprise, surprise: A lot of people watched the trailer for the Twilight saga's New Moon movie. Thirty-one million, to be exact. Granted, even more people probably gazed at the assets in Christian Serratos's revealing PETA ad -- but that's another story altogether. YouTube helped a small wedding make a big splash this year. Jill and Kevin, a couple from Minnesota, busted a move as they walked down the aisle -- in fact, the entire wedding party got pretty jiggy, nuptially speaking. The wacky dancers went viral, attracting thirty-three million eyeballs over the course of '09. A drugged-up little dude soared high on the YouTube charts, pulling in 37 million views worldwide. David, a seven-year-old boy, spouted off all sorts of nonsense following a trip to the dentist. Do his amusing antics warrant the massive merchandise and public speaking business that's sprung up since the video's success? God no. But at least they kept that Fred guy from being in this year's top five. As promised, the saucy Miss Boyle belted her way into YouTube's most-watched spot for 2009. The clip of Boyle's first appearance on "Britain's Got Talent" garnered a whopping 120 million views across the world. Who's the master of the house now? JR Raphael cooks YouTube-inspired cuisine at eSarcasm, his gourmet kitchen of geek humor. You can keep up with him on Twitter: @jr_raphael.